Specializing in Vertebral Axial Decompression. Call us at (631) 659-2980 today. West Hills Chiropractic Pain PC in Huntington, New York is the place to go if you are in need of professional and high-quality chiropractic care. Our chiropractor specializes in herniated disc treatment and cervical herniation treatment using spinal decompression on a VAX-D therapeutic table. Treating patients in Huntington and the surrounding communities in New York, Dr. Joe Ellis takes a whole person approach when it comes to chiropractic care. This means finding the root cause of your symptoms instead of merely treating the symptoms themselves, which is often the case with traditional medicine. As mentioned, our Huntington chiropractor specializes in treating disc herniation using spinal decompression. This type of treatment is done on an FDA-approved spinal decompression machine called VAX-D, which targets the cervical and lumbar spine. Along with disc herniation and cervical herniation treatment, spinal decompression is also used to treat other conditions such as spinal stenosis, sciatica, bulging discs, and facet syndrome. We also use other chiropractic techniques and all-natural treatments including diversified technique, flexion distraction technique, manual adjustments, and physical therapy. For our patients who are recovering from an injury, or they have just had surgery, we also offer physical rehabilitation. Back pain - depending on the cause of your back pain and the location of the pain, our chiropractor can treat it with a variety of techniques including the diversified technique and the flexion-distraction technique. Sciatica - characterized by pain that affects the back and outer part of the leg, sciatica is usually caused when a spinal nerve root in the lower back is compressed. Headache and Migraine - chiropractic adjustments are an effective and natural type of treatment for different types of headaches, including migraine. Sports injuries - caused by repeated use of certain muscle groups and joints, most sports injuries can be treated with adjustments and physical therapy. Whiplash - known as the most common auto accident injury, our chiropractor can help you recover from neck pain associated with whiplash. Along with these conditions, our chiropractor will help you relieve you of any pain you have, treat your condition, and help you achieve your health goals. Are you experiencing back pain, sciatica, or have had a headache for days? Or maybe you're interested in finding out how our physical rehabilitation program can help you recover from an injury or surgery. No matter what your chiropractic needs are, call us at 631-659-2980 to schedule your appointment. 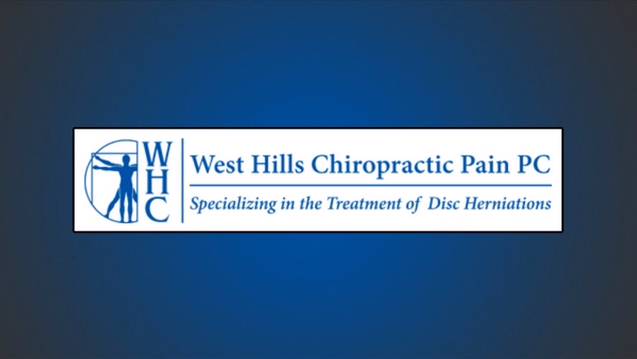 West Hills Chiropractic Pain PC is located at 400 W Jericho Turnpike in Huntington, NY. Love these guys!! Fabulous doctors! Really listen to you and get you moving again! I went here for an EMG and was plenty surprised. The place looks like a dump until you walk in and see that it is ultra modern. The technicians that I met with were more than professional and although I was Zapped it was a fun experience. Dr. Mills and the friendly staff at West Hills Chiropractic are not only talented and courteous professionals, but they are also wonderful people who care deeply about the community they serve. In addition to their expertise, they dedicate much of their time volunteering with KiDS NEED MoRE to help children with cancer & life-threatening illness. With Dr. Mills and the good people at West Hills Chiropractic, you are not only in good hands but with good hearts.